Recorded "Live" At Tsubo-Berkeley, CA. The incredibly inventive concepts and style of Wes Montgomery profoundly influenced and permanently changed virtually every jazz guitarist of his day and thereafter, and a wide range of rock musicians as well. 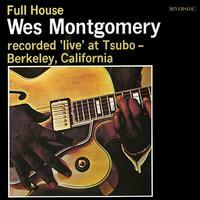 Yet it is often claimed that Wes was rarely recorded at his very best, that his club performances gave off more warmth and excitement than his studio work. This is his only "live" album for Riverside, his first label, and it is a classic session, featuring tenor sax great Johnny Griffin and marking Montgomery's first meeting with the acclaimed trio of Wynton Kelly, Paul Chambers, and Jimmy Cobb — then working together as Miles Davis's rhythm section.